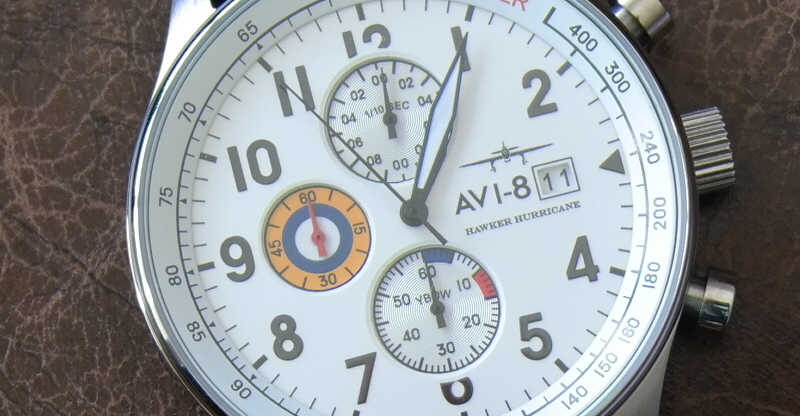 AVI-8 is a relatively new brand selling budget watches aimed at the aviation enthusiast. The humble pilots watch has always had a big following amongst collectors and it makes sense for any new company to concentrate on what it knows is a successful niche in the market. AVI-8 have such a huge range of watches and styles, you will find it very difficult to find something you don’t like. There are literally hundreds of models with various movements (manual wind, automatic and quartz) and all at a very affordable price. 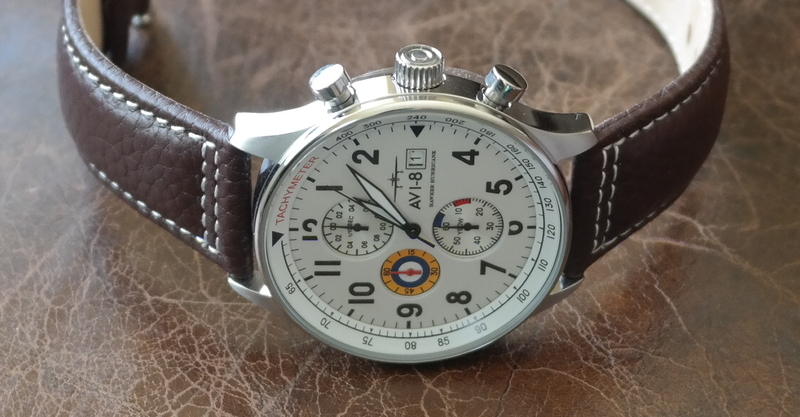 We have to remember that not everyone can afford a high-end pilots watch, and most budding collectors don’t have a budget that reaches over a few hundred pounds. Do you know what I like about this brand? Well, it’s the fact that they don’t pretend to be something they are not. The brand openly boasts about its budget origins and makes no secret of its movements unlike some brands I could mention. They have an excellent website with an abundance of information and images. It’s slick and very easy to navigate. You should also check out their Twitter account as they frequently tweet some great industry news which is not just related to their own brand. These guys have embraced social media in a big way, and it works. The Hawker Hurricane 4011 tips its hat to the legendary fighter planes of World War II. The designers have tried to achieve vintage look at an affordable price without compromising on quality and I have to say this is a dam fine-looking watch. The case is made of polished stainless steel, and unlike most pilot watches is relatively small 42mm which will appeal to most buyers. The finishing is excellent and I love the small lugs, which again give this watch that vintage appeal, but also mean it doesn’t look oversized on a smaller wrist. 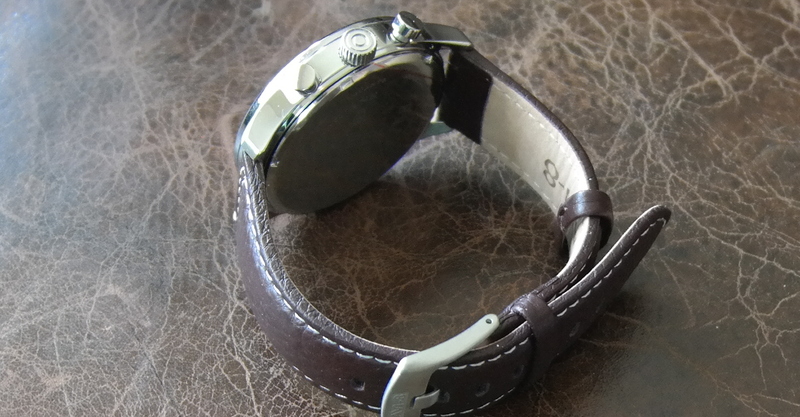 I do like the chronograph pushers and also the larger sized crown, which add to the overall aesthetics of this piece. 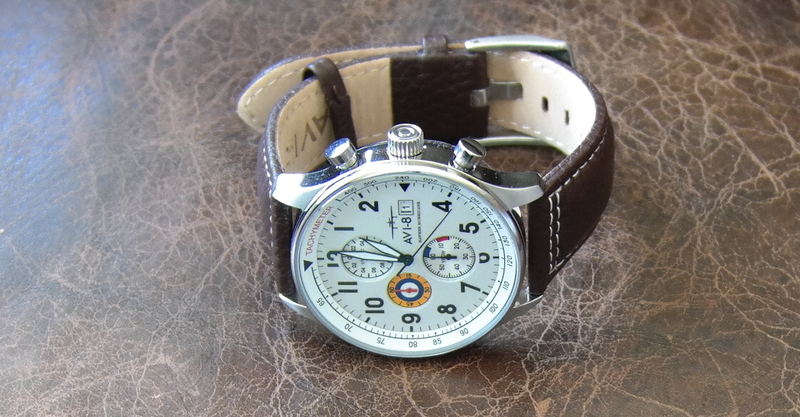 The silvered dial features the chronograph sub-dials, and also the RAF insignia is displayed on the elapsed chronograph minutes at the nine o’clock position. The framed date window is shown at the three o’clock position and sits below the AVI-8 logo. The Tachymeter scale is also shown on the outer edge of the dial. The hour and minute hands are in white, and have a fair coating of lume, which should help you when flying your paper airplane over the bathtub in the evening. If your plane decides to take a dip then no problem as the watch is water-resistant to 50 meters. I do rather like this dial. It is highly legible and offers superior quality for the price. Inside the watch we have a reliable Japanese quartz movement. Yes some of you may gasp at the fact I am reviewing a watch with a quartz movement, however we have to remember that some people prefer a quartz movement over an automatic. It also keeps the price low. 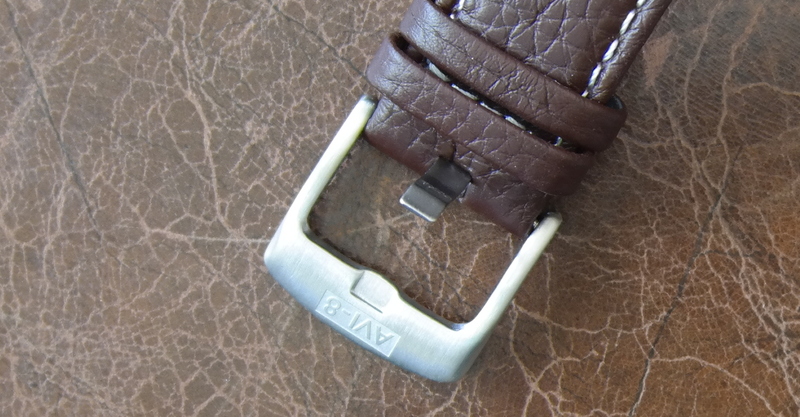 The strap is genuine leather and sports a rather fine brushed stainless steel buckle. When I was much younger I can remember scouring the streets of Derby looking for nice watches that were within my budget, and back in the eighties it was brands like Seiko and Casio that dominated the high street. You really didn’t have any choice if you wanted something out of the ordinary. The beauty of the Internet is that it has enabled many brands to reach a wider audience and best of all it has enabled many budding horologists to engage their passion for collecting, without being tied to the same old high street brands. Not everyone wants to spend big money on a watch, but most people will at least want something that looks pleasing. AVI-8 offer good-looking watches at a very affordable price. They have something to please even the most discerning gentleman and a huge range of classic designs. Most people will buy a watch simply to tell the time and do not care about the name on the dial. It is easy to forget this when regularly feasting one’s eyes on high-end luxury watches but no thanks to AVI-8, most people can get a taste of history and style without having to break into their life savings. You should buy a watch because you love it and no doubt AVI-8 will succeed because they simply do nice looking watches that appeal to everyone. The RRP is £280 (gbp) but you can find these watches on Amazon and other shopping sites at much lower prices, so hunt around for a bargain!